For over 20 years, the Pivotal Therapy System has been used by physical therapists, massage therapists, and chiropractors to treat soft tissue issues related to the spine. By nature, it takes time to slowly re-posture the spine and its soft tissues. Based on the progressive increments of time and gravity, this system strengthens muscles which helps maintain healthy spinal alignment. 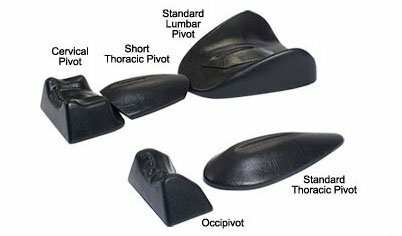 Each component of the Pivotal Therapy System may be used individually to address a patient's specific problem or the whole system can be used to treat the entire spine. If you have any questions about this product by Pivotal Therapy, contact us by completing and submitting the form below. If you are looking for a specif part number, please include it with your message.